When you're thinking of garage storage ideas it helps to make a list of what you want to store so that you can figure out where it's all going to fit. I'll start you off by having a go at making a list. Laundry - maybe you have the laundry in your garage. 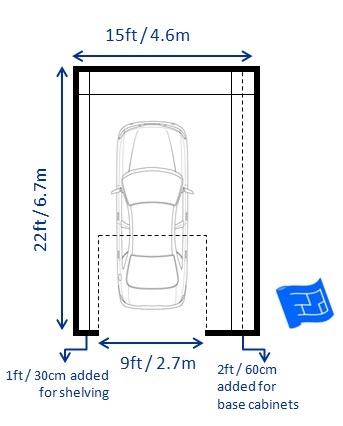 There are lots of manufacturers out there with great garage storage solutions on offer. I've gathered some pics of them for you towards the end of this page. 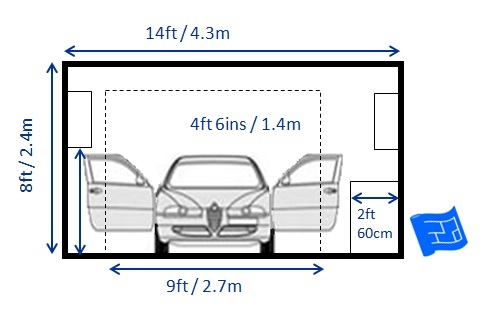 On this page I'm going to concentrate on whereabouts in the garage the storage can go and the effect this has on garage dimensions and layout. Some of the stuff in your garage you'll want to be able to get your hands on quickly so it makes sense to hang it up or store it on open shelves. For the items that you use less often, or if you want a tidier look in your garage, closed storage might be the best option. Make sure you include some locked storage in your garage for anything that's particularly valuable or for anything that mustn't get into the hands of children or intruders. First of all let's consider storage mounted on the upper parts of the walls in a garage. 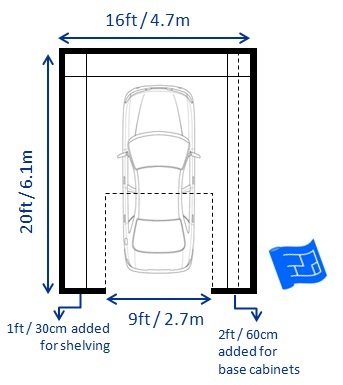 The beauty of this idea is that, if mounted high enough the car doors can swing underneath the storage, so this is a good storage solution for garages on the small side. Here's what it would look like on a floor plan. Now let's move on to take a look at storage which takes up space on the lower parts of the walls. I've assumed the same depth as a kitchen cabinets. First of all we'll just add lower wall garage storage to one wall. From above in floor plan view this looks like this below. 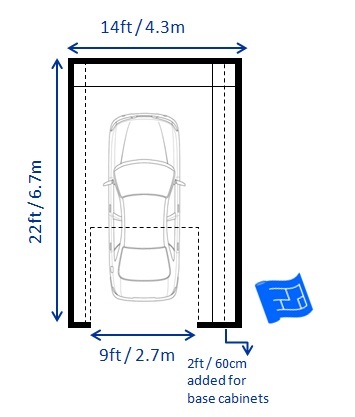 Notice how the storage arrangement means it makes sense to have the garage door placed off centre. Here's what that arrangement would look like on a floor plan. 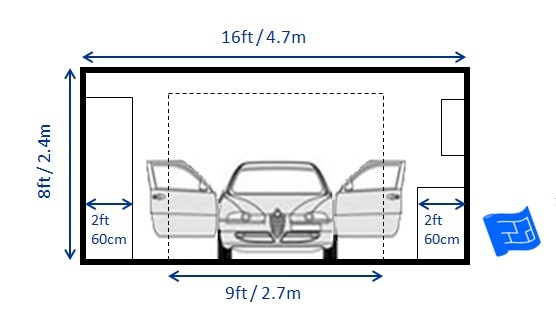 You can see here that there's also storage in front of the car. Here's another set up with one side with base and wall storage and the other with narrower shelving. Here's what that set up looks like in floor plan view. Once again this is an asymmetrical arrangement and the door needs to be placed off centre. Using the roof for garage storage is a popular option. 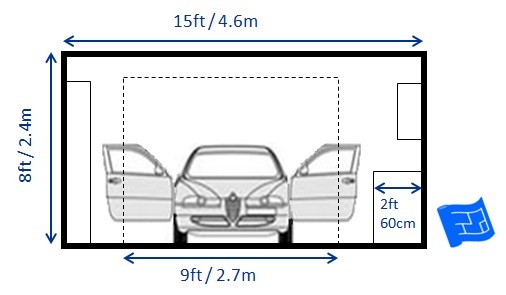 The area above the hood / bonnet of your vehicle. This is only an option if you don't need to walk into that area of the garage. The central roof area. 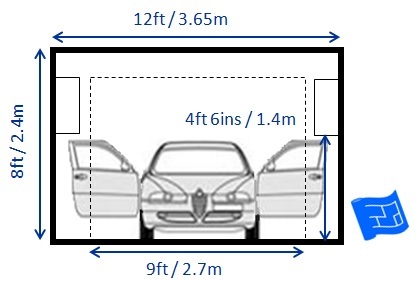 The depth of storage available depends on the height of your garage and what headroom you want to have left. If you have an apex roof on the garage you can consider opening up the roof space to storage. Above the garage door. 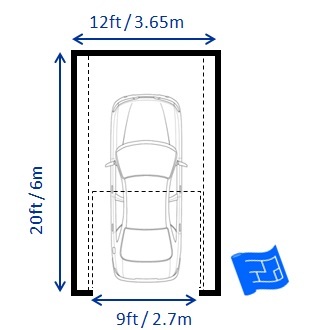 The amount of storage that will be available here depends on the height of your garage door. Of course, if you have older style doors which open to the outside you'd have the same depth of storage available as the central area. If possible, put your roof storage racks onto a pulley system which will allow them to be raised and lowered. This makes the storage so much more accessible. Use boxes that fit well with the storage depth to keep things organized and accessible. There's a good picture of this in the real life garage storage ideas pictures section below. Use your roof storage racks to provide a way to hang things like bikes. So far it's been all about where to put your storage. Here's a few pics of some garage storage ideas in real life.